Huchuy Qosqo Trek: Live the experience with the Andean local families and Hike the Short Inca Trail to Machu Picchu, help us supporting our Non Profit project spending the night in one of our rustic cabins and enjoy the experience with andean local families on the way to Machu Picchu. A fantastic combination for people who are looking Local living experience and the Short Inca Trail. 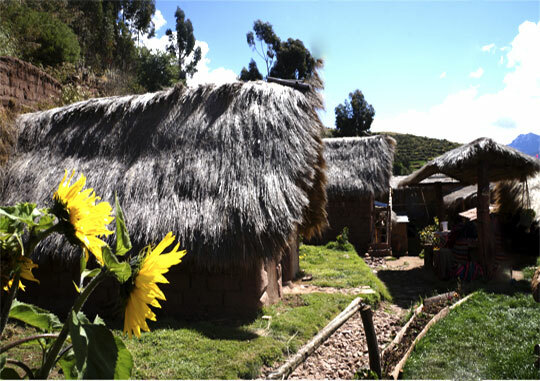 Departing close from Chinchero with a weaving demonstration process, following through a mountain pass and finally reaching Huchuy Qosqo local family homestay, an ancient Inca archaeological site perched on a cliff with stunning views over the Sacred Valley of the Incas. We begin the Short Inca Trail hike from the train stop at Kilometer 104 and follow the trail for six hours to the spectacular view of Machu Picchu from Inti Punku (Sun Gate); from here descending into the world famous Lost City of the Incas; Huchuy Qosqo Trek to Machu Picchu with local living and . Pick up from your hotel and transfer to the train station, here you will board the train that will take you to Km. 104 or Chachabamba, from where we will start the four-hour ascent that will take us past spectacular overlooks above the great valley, then beneath a lovely waterfall near the delightful site of Wiñay Wayna. We ascend through this largest and most exquisite of the Inca Trail sites, passing its chain of ritual baths and elegantly curved terracing, and then joining the main Inca Trail. Suddenly we cross the stone threshold of Inti Punku (Gate of the Sun) and encounter an unforgettable sweep of natural beauty and human artistry —a backdrop of twisting gorge and forested peaks framing the magical city of Machu Picchu. We walk the last half-hour or so down the royal flagstone walkway, past outlying shrines and buildings and through the heart of Machu Picchu, taking a bus to the small town of Aguas Calientes. Excursion to Machu Picchu from Aguas Calientes, short ride (25 minutes) up to the citadel of Machu Picchu. Upon arrival, and you will participate in a guided tour, visiting the Main Plaza, the Circular Tower, the most important preserved Intihuatana, the Royal Quarters, the Temple of the Three Windows. 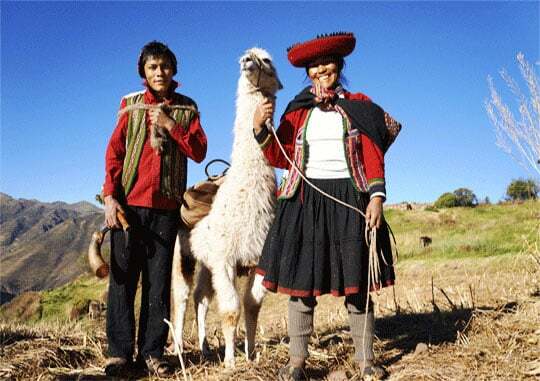 Enjoy the experience with the Andean local families on the way to Machu Picchu A fantastic combination for people who are looking living an experience of Andean culture and the Short Inca Trail. Departing close from Chinchero with a weaving demonstration process, following through a mountain pass and finally reaching Huchuy Qosqo local family home stay, an ancient Inca archaeological site perched on a cliff with stunning views over the Sacred Valley of the Incas. We begin the Short Inca Trail hike from the train stop at Kilometer 104 and follow the trail for six hours to the spectacular view of Machu Picchu from Inti Punku (Sun Gate); from here descending into the world famous Lost City of the Incas, Machu Picchu.